Andrew Graffagnino fixes a boat at the Island Boatyard. Kimberly Auth of Table of Content, which is featuring a new spot serving coffee and pastries outside. Buy an Island-made baby gift. Enjoy a cappuccino sitting in the sunshine or a big-screen movie in your backyard. Craving sushi? You won’t have to leave the Island. Becky Smith at her Shelter Island Florist shop stands ready to fill your Easter order and to help you prepare for spring plantings. 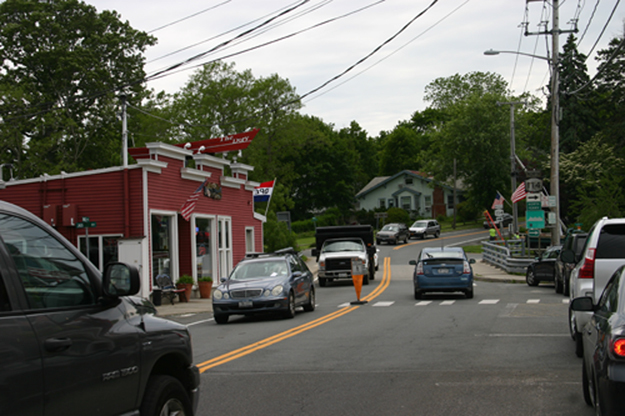 Merchants, board look to lower speed on Bridge St.
AMBROSE CLANCY PHOTO | Traffic rolling through Bridge Street last week. Business is accelerating with the summer season for Bridge Street merchants. But a serious downside is cars and trucks speeding past with a human tragedy just waiting to happen, according to some of the business owners. At a recent Town Board work session, Councilman Paul Shepherd said he had spoken to the merchants on Bridge Street concerned about traffic racing through at high speeds. Jack Kiffer, owner of the Dory, said he’s worried someone is going to get “clipped.” Mr. Kiffer’s seen more than a few near misses, with people having to step back quickly to the curb with cars, and especially trucks, barreling through. “Coming down the hill, with a posted speed limit of 25, traffic’s doing 40, 45 [mph] at least sometimes,” Mr. Kiffer added. Marie Eiffel, co-owner of Redding’s, said she’s noticed cars going much too fast along Bridge Street. ”Trucks, too, but trucks are always going too fast,” Ms. Eiffel said. Townsend Montant, manager of Shelter Island Wines & Spirits, said he’s noticed speeding cars, but didn’t consider that the main problem. Mr. Montant said people are U-turning at will on Bridge Street causing traffic disruptions and a hazard. He suggested a sign against U-turns and better enforcement overall by the police department. He also noted there was only one marked crosswalk and another should be established at the liquor store and Piccozzi’s gas station. Bridge Street is Route 114, a state road, and so the town doesn’t have the jurisdiction to set speed limits. The same decision is in the state’s hands for putting in speed bumps, which has been suggested. But Supervisor Jim Dougherty has let the New York State Department of Transportation know there’s a serious safety issue. In a letter to Kevin Matthaei, a civil engineer with the regional DOT in Riverhead, Mr. Dougherty asked for a lower speed limit. The board has suggested that the police department deploy its mobile speed marking sign to slow traffic. This will allow the department to also gather data that can then be given to the state requesting a lowering of the limit.